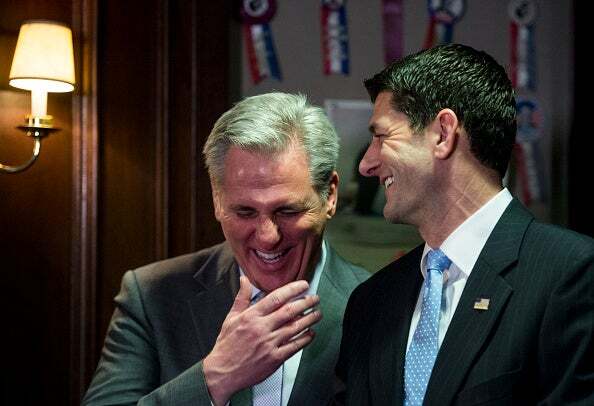 Have You Heard Kevin McCarthy’s Joke? So you think that a Republican congressional leader really thought Putin and Trump were in bed with each other? (interruption) Do you think Trump and Putin are in bed with each other? (interruption) No. So you think this is a Republican establishment putting the screws to Trump? (interruption) Wow. Well, here’s the story on this. This is from Breitbart. Headline: “Media Hysteria: [Washington Post] Treats Kevin McCarthy Joke as Proof of Trump-Russian Link.” So the Washington Post has released the latest salvo in the media’s effort to take down Trump today. It was actually yesterday. “‘Ryan: The Russian’s [sic] hacked the DNC — McHenry: — to get oppo Ryan: — on Trump and like delivered it to…to who? (unintelligible) McCarthy: There’s … there’s two people, I think, Putin pays: Rohrabacher and Trump… (laughter) Swear to God. Ryan: This is an off the record. (laughter) NO LEAKS. (laughter) All right? '” They’re all laughing nervously, and then Ryan is heard saying on the tape, “‘This is how we know we’re a real family here.’ The full context of the conversation is unclear, but the House leadership appeared to be discussing the crisis in the Ukraine, and Russian efforts to spread disinformation there. Look, there’s one thing that’s undeniable. These people on the left do not get satire. They do not get parody. They have no sense of whatsoever, especially when it’s directed at them. Now, Putin paying Trump? When did this happen? This happened last year, and it’s before the election. And the news is all… The Democrats have been trying to establish this connection with Trump and Russia for… Well, it’s over a year now, and there hasn’t been you any evidence for it. So these guys get together and the Republican leadership in the House. They’re joking around, and they’re primarily talking about Rohrabacher, then McCarthy says, “There are two people Putin pays. I think he pays Rohrabacher and I think he pays Trump.” Ha-ha-ha! Ho-ho-ho! Hee-hee-hee! Now, it’s interesting that Mr. Snerdley doesn’t think this is a joke. (interruption) Well, look, you know, nobody’s gonna asking, “By the way, what the hell is the Washington Post doing with the tape? (laughing) How did they get the tape?” Nobody’s gonna ask that. Look, this is a private conversation involving the Republican House leadership. How’d the Post get the tape? So you know what they did? They gave the tape to… I think it was Chuck Schumer or the current leader in the Democrat House of Representatives. (interruption) Oh, that’s right. They gave it to Jim Baghdad McDermott. Jim McDermott! So this couple, they were apparently out Christmas shopping in the Cadillac, family Cadillac, and they’re scanning cell phone calls on their radio there on the dashboard of the Cadillac. They even had a tape recorder! Oh, yeah! They had a tape recorder. Just a hobby. Just a hobby. Just a couple that was… Well, you would never… They were just an old couple driving around trying to enjoy their last days. They got this cell phone device, and they got a recorder! So they record Mr. Newt in strategy session with somebody. It might have been Boehner. And they thought, “You know what? This might be historic. We’ve got the Speaker of the House here.” (laughing) So they gave the tape to the Democrat leaders in the House, and they gave it to the Washington Post. And the conversation between Mr. Newt and whoever the Republican leadership got published. And here we are again: Another Republican leadership tape ends up being recorded and given to the Washington Post. So how do you think that happened? I don’t know. (sigh) We know that people in the media are lazy. They sit around and wait for people to give them things. And, you know, I think people are loving becoming sources too. Especially if they’re anonymous? If you could… Imagine this. Imagine you are able to call a reporter and establish a relationship, and this reporter will protect your identity. Even go to jail before revealing your identity! Wouldn’t it be fun to tell that guy anything? If you could leak any, you could tell a reporter anything and never have your name attached to it? I think this is what’s happening. I think people are loving being sources. They love being “unnamed former official,” former and current U.S. government officials. Somebody in the Republican leadership had to give them the tape.